This unique twist on a tamale turns a popular Mexican meal into a classic American-style comfort dish that is positively delicious. A base of cornbread mixed with corn, green chilies, and fresh jalapeños, topped with shredded chicken, enchilada sauce and cheese, come together to put a tamale into casserole form. It’s a quick and easy dish to prepare and heats up great the next day too. This was so good and so satisfying…it was a great Weight Watchers Dinner Recipe that the whole family could enjoy. 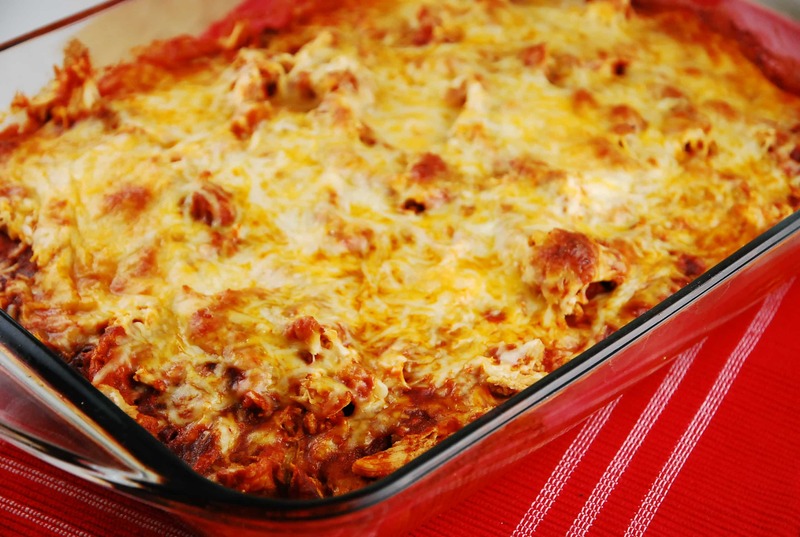 A Mexican tamale in casserole form, this is one incredibly delicious meal. Perfect idea for a busy weeknight dinner, it’s a snap to prepare. Preheat oven to 400 degrees. Spray a 13 x 9 baking dish with nonfat cooking spray. In a medium sized bowl, combine, cornbread mix, corn, milk, egg substitute, green chiles, jalapeños, 1/4 cup of the cheese, cumin, paprika, and salt & pepper. Mix well, then pour into baking dish. Place in oven and bake for about 15 minutes. Remove from oven and poke all over, using a fork. Pour 1/2 of the enchilada sauce all over the top. Then evenly cover with the chicken. Pour remaining enchilada sauce over chicken and top with the remaining cheese. Return to oven, and cook for another 12-15 minutes, or until the cheese is golden and bubbly. I’m entering this into my Recipe Builder now on the WW website, and I subbed in the Jiffy corn muffin mix, and I can’t seem to work it out to less than 8 Points Plus per serving! Is the difference in the mix? What could be causing this? Should the bottom be baked all the way through when it comes out…mine is still rather liquidy…should it have a cornbread texture? Hi there! your site is sooo amazing! I just started WW and your site is so helpful. Just want to ask can i use regular canned enchilada for this? or the one you used has better nutritional facts? Fantastic! Thanks for such a fabulous recipe! I know this recipe was posted ages ago, but I just discovered it recently. I had to stop back by and tell you that my family LOVES it. I’ve made it 3 times in the last month and it is always a hit! What a nice weight watcher friendly crowd pleaser. And a bonus, with just chicken and cornbread (always on hand) this is an easy and economical meal as well! This was the inspiration for Tamale Tuesday at our house! Everyone raved over this delicious casserole. NOM NOM! I think my husband will like this. Question though, can I substitute with a homemade cornbread somehow? I have a lot of cornmeal to use up. Would I basically just mix up a homemade recipe and add it like I would a mix? Thanks for being awesome. Yes….just create the dry homemade mix, and you can use that. This recipe is absolutely delicious! Can you give me a breakdown of calories per ingredient? I can’t get my 8 serving’ s below 290. Thanks! Can you use jiffy corn bread mix, and can you use the package enchilada sauce? I sprinkled some fresh cilantro and green onion. We loved it thank you for this recipe it is a keeper! I spinkled some fresh cilantro and green onion. We loved it thank you for this recipe it is a keeper! Yes, I used a for scale to weigh it out. I actually just ended up using the rest of it when I made the casserole again about 2 weeks later…even though it was a bit less than 8oz, it still worked out just fine :). So, if you wanted, you could just divide the box in half to make the recipe twice. Kind of a goofy question but can you use regular eggs instead of the egg substitute? Yes, absolutely! I just use the egg beaters instead of actual eggs because it eliminates extra fat and cholesterol. Thank you so much for another DELICIOUS looking recipe!!! I ordered my sauce and cornbread mix today, so hoping to make this one next week :) I haven’t tried one of your recipes yet that I don’t like, so I’m very confident this one will be another winner!! Thank you so much for taking the time and energy to share with us!! I made this last night and I CANNOT TELL YOU ENOUGH how amazingly delicious it was! Thank you so much! Hi Wendy – I am wondering if you can make this ahead of time and then just heat up? I’ve never had tamales so don’t know if the crust will get too soggy? I’d like to make it for a friend and her family, but didn’t know if I should assemble it or just have the crust and everything ready and she can assemble. Thanks!! BTW – LOVE the site and I enjoy your Friday Finds. I have tried many of the products you share. Hmmmmm…good question! I’ve reheated next day leftovers on this before with no problem whatsoever, so I’m guessing that it would be fine. Glad you are liking the recipes…thanks so much for reading! Thanks for the reply. I made it last night and made a pan for my parents (gave it to them un-assembled). My husband and I loved it as did my parents. My boys (6 & 12), however, took a few bites and were done – more for me :-). Ripping off another Emily Bites recipe without any credit… I’ve seen you do this so many times. Your recipe/word choice is way too similar to be a coincidence. I saw you do the same thing with her buffalo wing hummus recipe. Amanda…I think you may be mistaking me for someone else. I have never posted a Buffalo Wing Hummus recipe. And as for the Tamale Casserole Recipe, there are TONS of them online…and they all are very similar. That being said, I looked at the one on Emily Bites and it is identical to the one on Cooking Light, so…yeah. My version is similar, but still a little different. Amanda, LaaLoosh is right… there are so many versions of this recipe, going back to the 80s when my mom would make it for me! Come on now, recipe mods, borrowing, and inspiration happen so often now because of the internet. I’ve seen GIna from Skinnytaste post many versions of LaaLoosh’s recipes, but I don’t hear LaaLoosh crying and bitching about it. It is what it is, and intention is everything.. your anger is misplaced. That being said, I can’t wait to try this lightened up version… it’l take me back to my childhood. Thanks, LaaLoosh, for everything you do. I have to agree with Ms. Lee. I have seen lots of versions of everyone’s recipes all over the net. If you like Emily Bites site so much maybe you should stick with getting your cooking inspiration from their and stop trolling Laaloosh. I am glad to have a place to come find lighten versions of recipes that actually taste good. Thank you Laaloosh! Where did you find the enchilada sauce? I haven’t seen that one before although I have heard of Frontera. Got mine at Whole Foods. You can order is from Amazon! I found the Frontera brand at Rainbow Foods (Roundy’s). Probably a Midwest store. I found a another brand at the other local grocery store. I made a pan for my parents with the “other” brand and they loved it so I would try any brand of sauce you can find. This was so delicious and pantry friendly. My 2 year old and four year old ate it too. I just omitted the jalapenos and substituted red bell pepper.